The uneasy relationship and growing resentment between Mary Queen of Scots and her cousin Elizabeth I of England. With England’s perceived ongoing threat of Europe, and Scotland constantly agitating, it seems little has changed in the 500 years since Elizabeth I’s reign. Beau Willimon, of House Of Cards fame, has continued with his love of political intrigue, pitting two queens, with so much in common, against each other. Widowed at an early age, Mary Queen Of Scots returns to her homeland in 1561 but is immediately seen as a threat. Firstly she is a Catholic, which is enough to make Protestants like William Cecil to choke on their cornflakes, and secondly she is the heir to the English throne in the event that Elizabeth does not have children. The film essentially boils down to individual choices and political shenanigans. Mary acts on her emotions, marrying twice, but ultimately being let down by the duplicitous individuals, while Elizabeth decides to avoid those problems resulting in neither of them being happy, and yet in surprisingly similar predicaments. As tensions build, rhetoric increases, and political agendas take precedence with individuals briefing the queens against each other, Elizabeth is increasingly forced to act against her cousin. Despite being sold as a two hander, the film is very much the story of Mary. Saoirse Ronan is quite brilliant in the role, combining beauty, poise, warmth and intelligence to portray Mary as a fully rounded and engaging character and this is shown more than ever in the anticlimactic meeting between the queens. Margot Robbie however, seems to have drawn the short straw with duller dialogue and less screen presence. 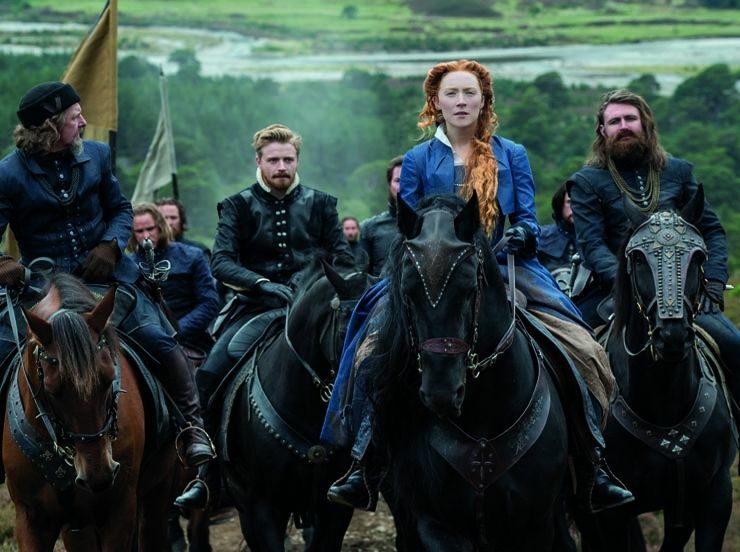 The support cast is solid with Guy Pearce, Jack Lowden, David Tennant and Martin Compton all playing political sharks, but the script is a little lacking, with the made up finale of the two queens proving to be something of a let down. That said, it is worth watching for Saoirse Ronan alone. Another spellbinding performance from Saoirse Ronan is sadly not enough to elevate this fairly ordinary drama.